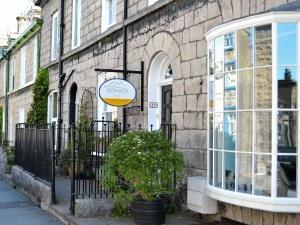 Welcome to Sonata Guest House – the only B&B in town with a VisitEngland Breakfast Award. Award-winning guest house in Kendal centre with free WiFi, parking permits included & locally sourced breakfasts. Very close to town centre and bus station. Railway station 8 minutes walk. Windermere 10 minutes driving. Children welcome from age 12. If you are driving from the South on the M6 take exit 36. Avoid the A6 to South Kendal which takes you through the town centre traffic and instead continue along the A591 bypass and when you come to a large roundabout (Plumgarth’s roundabout) take the last exit into North Kendal, and then at the first set of traffic lights take a left. We are Number 19 on the right side. If you are driving from the North on the M6 exit at junction 39, turning right onto the B6261. Then turn left onto the scenic A6 via Shap Summit which takes you to Kendal. You will go under a railway bridge and come to a small roundabout in Kendal (near the Kendal railway station). Turn right by taking the last exit onto Longpool and then continue straight over the first traffic lights onto Sandes Avenue where you will come to a right hand bend and past a second set of traffic lights onto Stricklandgate/A5284. Finally turn right at the next, your third set of traffic lights onto Burneside Road. We are Number 19 on the right side. Thanks Eaterina for taking time to review us. Hope to see you again, if you come back to Kendal.